Continuing on from yesterday’s post about starting a new design project, I thought I’d talk a bit more about my own process. As a lot of the design work I do is for clients, based on a brief they’ve given me. As such, I add an additional first step to get my brain in gear for the project. I find this is a great alternative to the burst of random inspiration that normally gets my own projects rolling. Maybe you’ll find it useful, too. 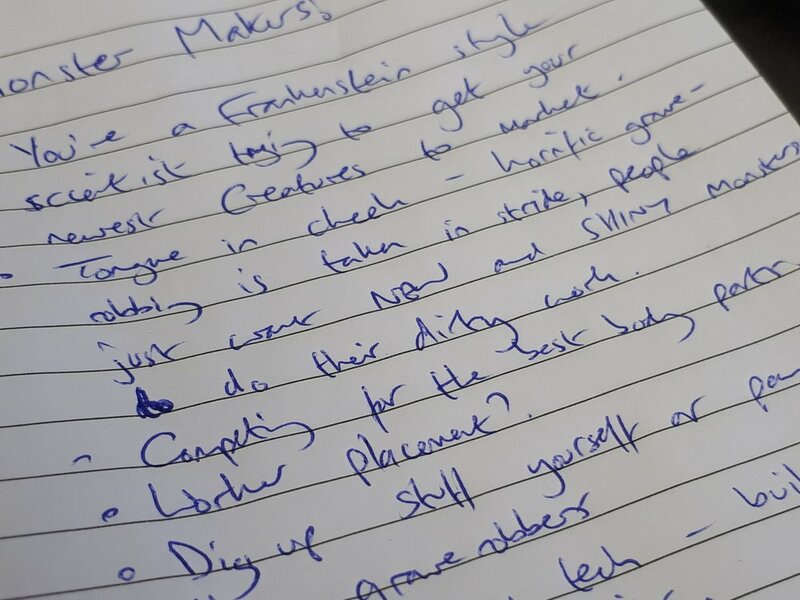 When I start designing a game, my first step is to scribble all my thoughts about it down into a notepad. What’s the theme? What’s the scope? Who’s it aimed at? What are the key mechanics? How do you win? How do players interact? What do I want the players to feel? All of this gets jotted down in no particular order, just to get it out of my head and clear some brainspace. I’ll invariably find that, as I’m doing it, fresh ideas pop up - so I write them down, too. A lot of my ideas don’t make it past the “crazed scribbling” stage, but that’s fine! I can always come back to them later. Usually, a few of these idea boards will cover game mechanics, so the next step is to flesh those out into something that I can start to put into action on the table - this is where I start making rough prototypes, as was discussed in yesterday’s post. Then it’s into the play / change / repeat cycle, and the design process is up and running! Idea boards are a great way to organise your thoughts, but I also use them to communicate with my client before starting the design in earnest. This gives them a clear idea of where I’m heading and what my plans are, and lets them give feedback on concepts rather than detailed mechanics (and as I said yesterday, the sooner you can get feedback on something, the less it hurts to remove it if it’s not right). As an example, here’s a neatened-up page of notes from when I was first working on Hellboy. I sent these over to the Mantic guys before I did any real work on designing the game, and it’s interesting to see which ideas survived the development process, and which ones were changed entirely. Big thanks to the Mantic folks for saying it’s okay for me to post this. As with yesterday, I’m gonna challenge you to give this a go. If you’ve got an idea for a game but you can’t decide how to get started, why not get some ideas down on paper and make some idea boards? Let me know how you get on in the comments!